Protecting users’ privacy is essential for turning networks and services into trustworthy friends. Many privacy enhancing techniques, such as anonymous e-cash and mix-nets, have been proposed to make users more comfortable in their network usage. These techniques, in turn, usually rely on very basic security mechanisms, e.g., confidentiality protection, for their realization. But these mechanisms are also used for other security related reasons. In this paper, we make some new observations on how security can degrade privacy. For example, using security as a component of an advanced privacy enhancing technique may not have the effect we expect; i.e., too careless application of security may defeat the assumed privacy gains. In particular, introducing new identifiers may make it easier to track users. This effect is especially harmful to mobile users. Even in cases when privacy is not the main driver for the use of security, we believe that identifiers require special attention in some circumstances. 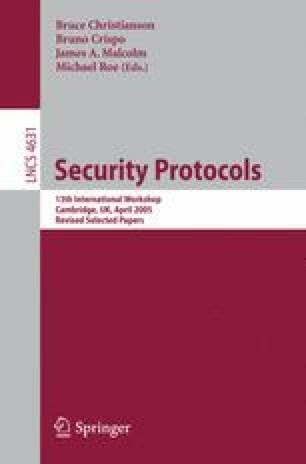 We propose a mechanism, which we call to allow the communicating parties to continuously change the identifiers they use, without any signalling and without adverse affects on realibility or security.